Can force be used on a circle move? Using UR5e and CoPilot software on a buffing application. The UR holds a tube and circles a 4" buffing wheel to buff the outside of the tube. Is there a way to apply a force towards the center of the wheel as the part moves around the wheel. Also, the buffer wheel wears over time thus, making the circle diameter smaller. Any way to compensate for this? 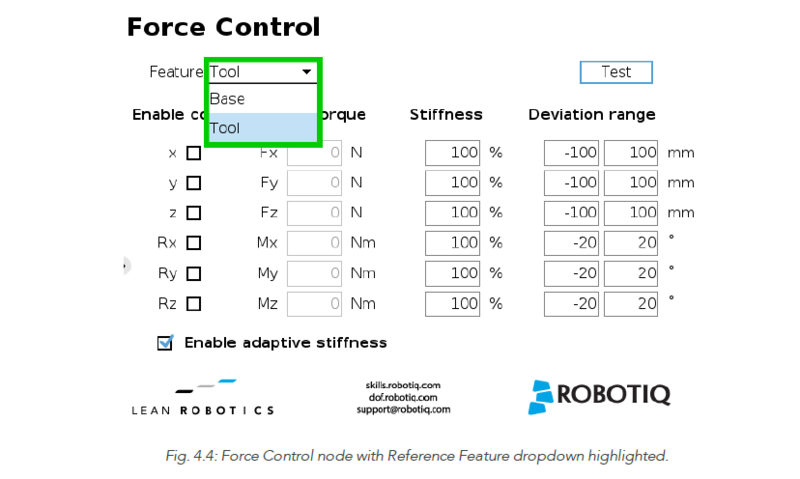 You can use a force control node to apply a force according to tool referential (base referential is select by default). You can for example apply a force on tool X axis. Then place a multi points path or a path recording under the force control. Your path should go around the wheel with the X axis of the tool always pointing inside the wheel. If the wheel diameter become smaller it will not affect the process. The robot will always try to apply a force on tool X axis.